Keeping industrial safety devices secure and under control is assured with the new PSEN 2.1-10 non-contact magnetic safety switch, in combination with electronic safety relays, programmable safety systems and the SafetyBUS open bus system; the new magnetic safety switch helps provide a complete industrial safety solution in accordance with accepted industry standards. Robust construction and dependable performance make these switches ideal for safety gates on machine tools as well as conditions with stringent hygiene requirements such as food processing, packaging, and pharmaceutical applications. Specifically, the PSEN 2.1-10 has a small, compact structure, which integrates easily with the industrial equipment and safety systems needing monitoring. Both the non-contact magnetic solenoid switch and its matching power output unit feature dust-tight and waterproof construction that is impervious to outside manipulation. Insensitive to shock and vibration, the switch components promise long service life, as they are mechanically non-wearing. The main application area for all mechanical safety PSENmech switches is found in classic mechanical engineering. The switches ensure that an open safety gate or unsafe position is detected and the machine stopped. For example they can be used to monitor safety gates on lathes or punching machines or to monitor safely the position of rams or carts on machine tools. Using increased extraction force on the actuator the PSENmech can prevent the safety gate from being opened unintentionally. They comply with the standard EN 1088 (protection against defeat) due to their mechanically-coded actuators. Mechanical safety switches PSENmech with guard locking also ensure that the safety gate is interlocked (guard locking) until the hazardous production process is complete. They can also prevent production from being interrupted as a result of unauthorised access. As a solution supplier Pilz provides the optimum concept for safe, economical safety gate and position monitoring: mechanical safety switches on the input side in conjunction with proven evaluation devices on the output side. 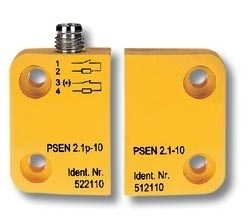 When a PSENmech mechanical safety switch is combined with an additional safety switch (PSENmech, PSENmag oder PSENcode) and used in conjunction with Pilz evaluation devices, you can achieve a safe, complete solution for applications up Category 4 in accordance with EN 954-1. The result is reliable components with maximum compatibility and BG/cUL approval. So they are suitable for worldwide use. Their high-quality manufacture ensures a simple, space-saving installation and a long product service life.